My husband has been out the farm for a week now, working his tail off. I arrived last Monday in time for the appliance and tile delivery. Too much tile. Way too much tile. 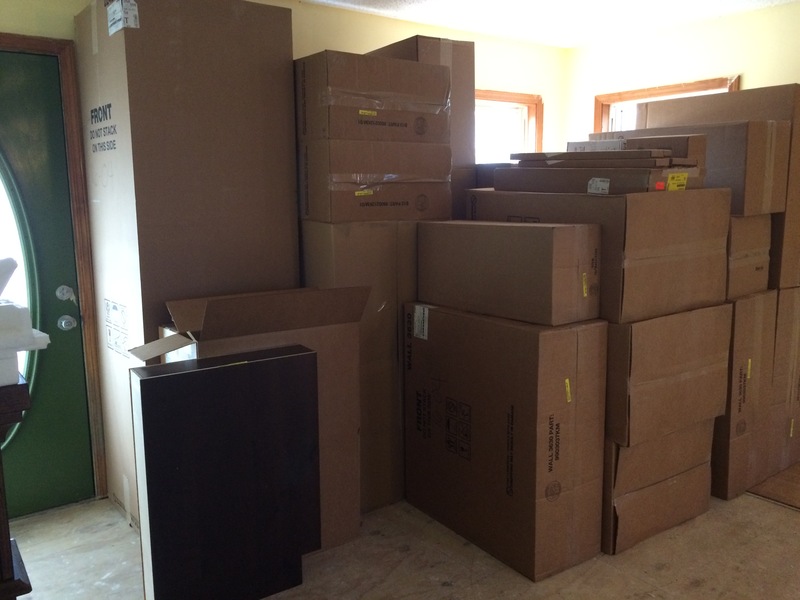 See, they were supposed to deliver all this stuff on November 16, then rescheduled to November 30, because they were still waiting on the tile. The problem was that they were waiting on the tile we’d canceled because the guy had written up and charged us for the WRONG tile. We were refunded the wrong stuff and ordered the right stuff within minutes of the first order. Minutes. Well, anyway, they took back the wrong stuff. Of course, I’m wondering what else got messed up . . .
Oh, yeah. 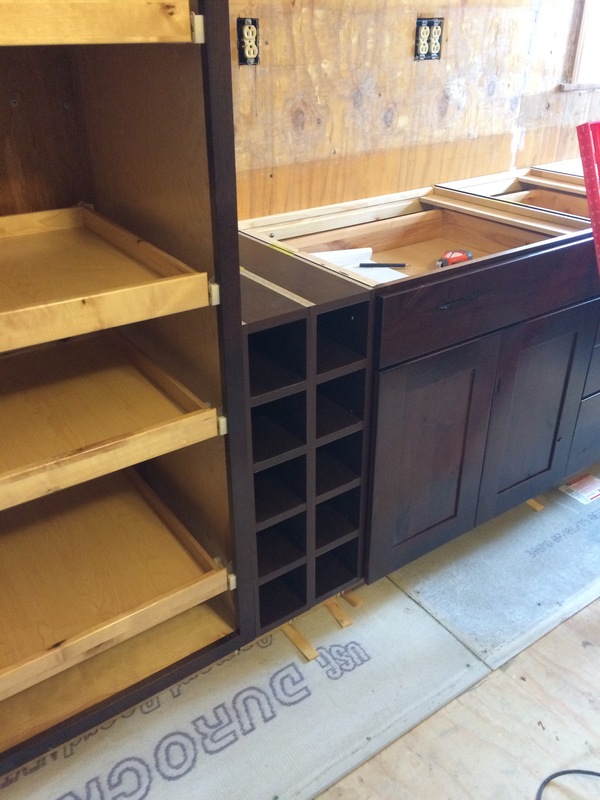 The cabinets. They arrived Tuesday, and I have to say, I was impressed with the delivery—both of them, actually. The first guys were hilarious—coming out from STL, it was probably the first time they’d been out in the boonies. The second guys—and one gal, come to think of it—arrived three hours ahead of schedule. Between Monday and Tuesday, I learned how to put down cement board. Gee, that’s fun. The drill took off a strip of skin on my thumb—from using it, not from the bit itself—and I have a couple blisters. Yay. And then we opened up the cabinets. Took me three trips in the truck to the burn pile. It looks like Mount Cardboard up there. Sadly, no pics! So the base cabinets got set. Remember now, we ordered this stuff the end of October, so I’d pretty much forgotten all the cool stuff—a bread box, a knife drawer, pull-out spice racks and pan holders, and a mixer shelf that lifts up. And the wine racks, of course. 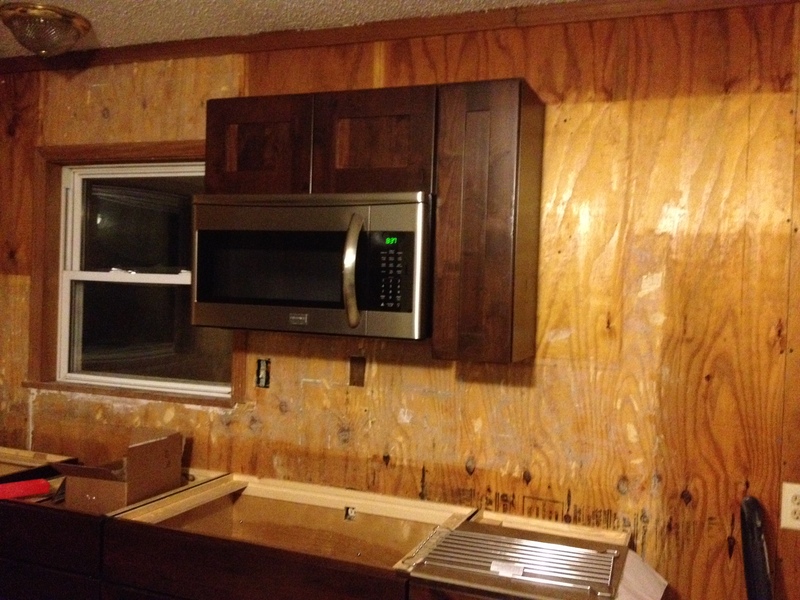 Then it was time for the wall cabinets. Oops. 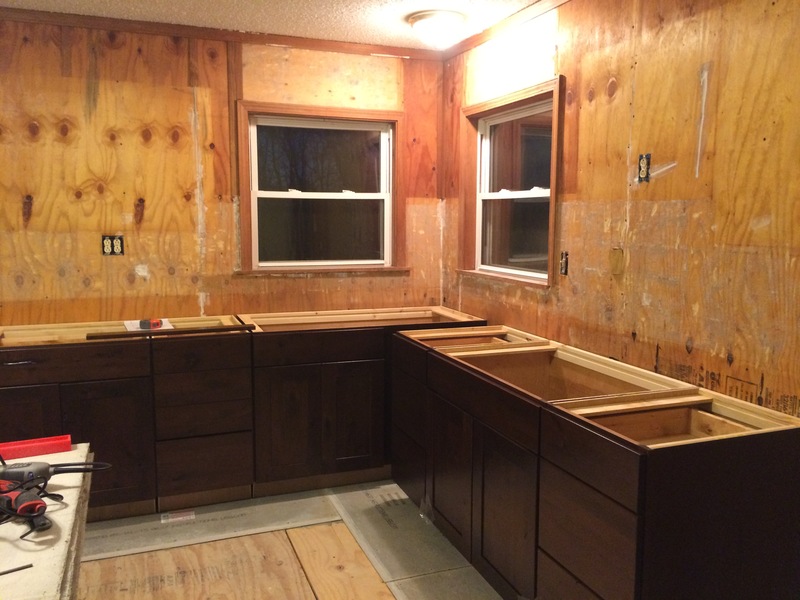 Between me and my math skills—okay, not “skills” but whatever—and the new guy who helped me design the kitchen, the wall cabinets were a little, um, off. Just a little. So. We ended up running into town to order two more and to return two. That was fun. More fun, however, was calling the next day after I realized the fifteen-inch cabinet we had opened to the right, not the left. It really does make a difference if the damn thing is sitting on the floor upside down . . . I had to head back to STL on Thursday, but our friend Ed came down to help. 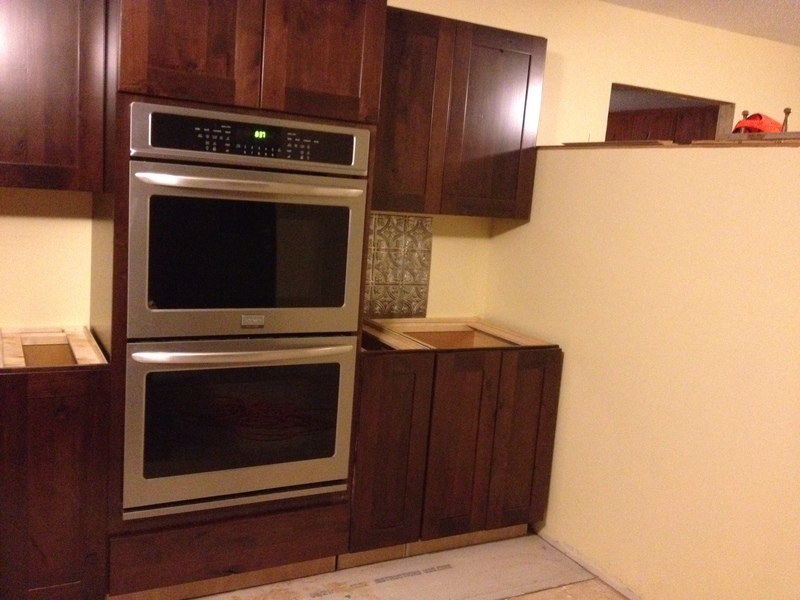 He arrived just as the counter guy was finishing the template for the granite, and he and my husband installed the microwave and the ovens—and I can’t wait to see them in person! They’re cement-boarding and tiling the rest of the weekend, while I, sadly, am stuck at my desk. And decorating for Christmas. And paying bills. 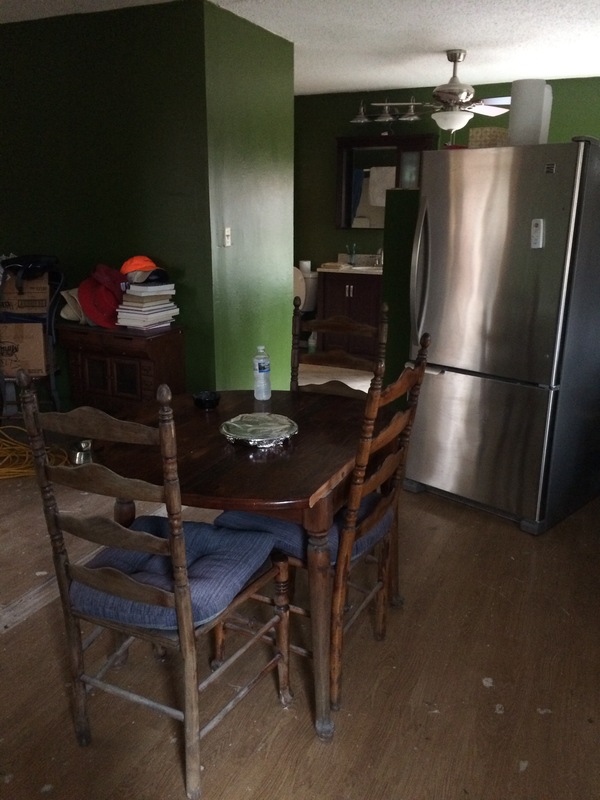 This entry was posted in Work Wednesday and tagged abby, apocalypse, dystopia, kitchen, Missouri, novel, prep, prepare, remodel, robin tidwell, rocking horse publishing, shtf, st louis. ← Prep Monday—Everyday Carry or Not? Very pretty. Poor Dennis. Lots of work. Poor Robin – I’d be itching to get out there! 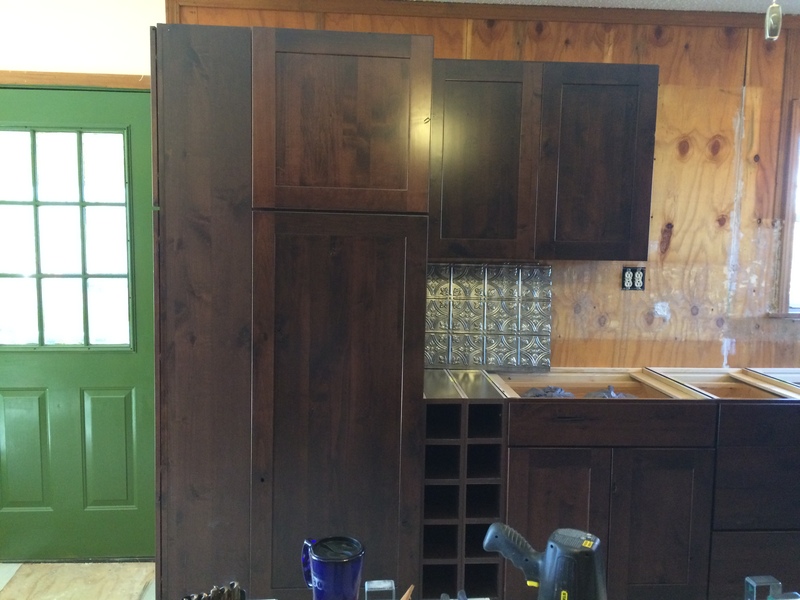 LOVE the cabinets! Very pretty color with the simple face lines. Thanks! Last night was hardware, today is tile…ugh. Gotta love remodeling! 🙂 Can’t wait to see the finished pictures. We are planning to tackle projects for our house this year, too. I’m looking forward to the end product, but not getting there. So far, I’ve laid 20 18″ tiles. My back is pissed! !